We arrived in Killarney on the 27th and are staying at the Neptune Hostel which is just off main street and very near the magnificent Cathedral here. Several folks are talking about celebrating mass there tomorrow. After dropping off our bags and food, we high-tailed it to Ballyvourney where we had a social dance class with Timmy “the Brit” McCarthy at the Mills Inn. It had been four or five years since Timmy had visited us in Charlottesville, but he hasn’t lost any of his energy or quick humor since we’ve seen him. After we moved outside and finished the last couple of figures, the dance morphed into a session with at least a dozen different musicians and singers from the Ballyvourney area with a few songs from the on-lookers egged on by the session leaders. 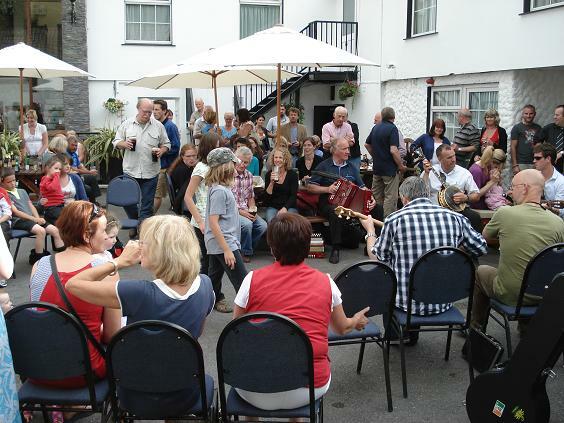 After we finished our delicious (and huge) meal on the patio, the BRIMS musicians and dancers joined in the craic. It was a lovely, special evening for everyone and we soaked up the hospitality of our hosts from Ballyvourney. On Day 2, a group visited Cork and Blarney Castle with the requisite kissing of the Blarney Stone. 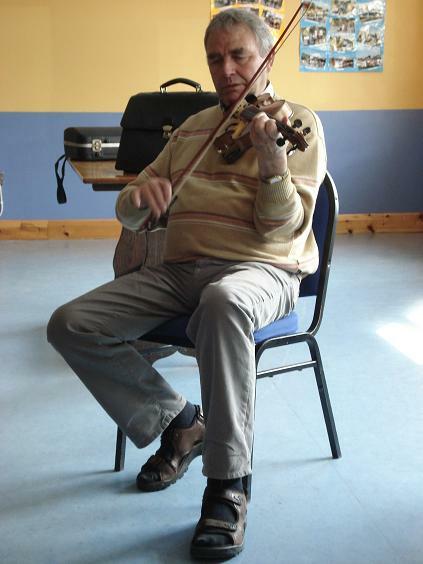 The fiddlers went down past Ballyvourney to take classes with Connie O’Connell. He taught us a good 8-10 tunes including some really cool slip jigs which I’ll post on here when we get back to the States. 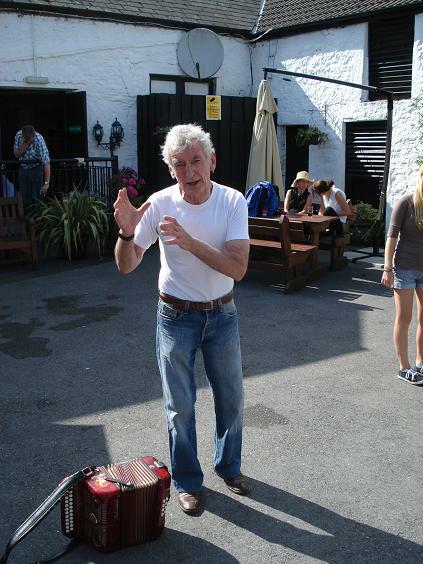 He also had some really good tips for the beginners and taught the tunes to the advanced class at a mighty rate. On Day 3, no classes were scheduled so everyone explored the area around Killarney… some by foot, some by bike, some by car. Our group went out a bit past Kenmare (which looked like a lovely town – we snacked in the town square). 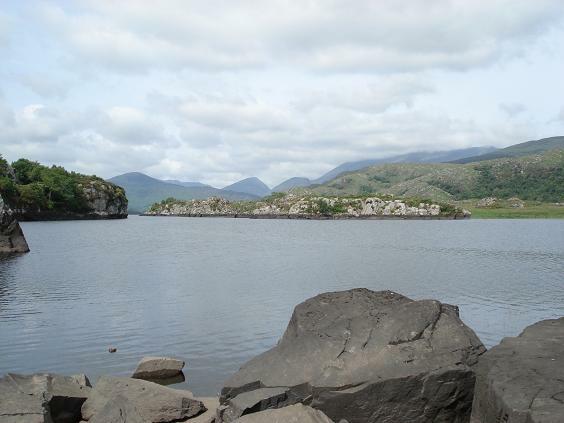 Kenmare is on the southern side of the Ring of Kerry and our route took us by a number of gorgeous views of Killarney National Park. Here is one of the views along the way. The full schedule was catching up with all of us, but it’s all just too wonderful not to squeeze it all in. 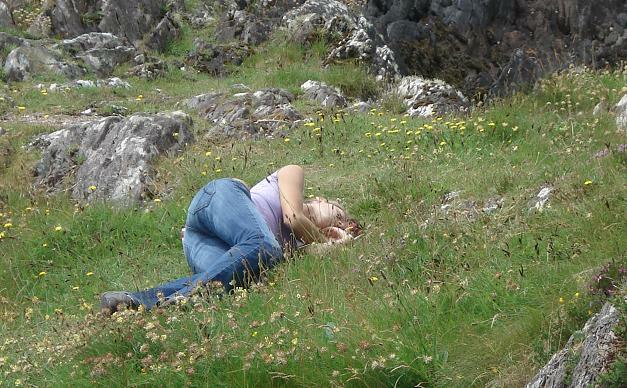 Sometimes you just have to catch a nap wherever you can… preferably in a field of heather. Great fun to see and hear what you guys are doing over on the Emerald Isle. Hope to hear more stories and play a few tunes once you cross the Western Ocean back to America. Oh, the pictures bring back such great memories of Ireland . . . so beautiful. I’m glad you all are having a great time – I can’t wait to learn some of your new tunes when you get back!